Rusted Pulchritude | Wooden Wares in Ellsworth, Maine. As you all know, we’ve begun a little series on featuring some creatives, small business owners, makers, etc. as the holiday season is underway. We love to support New England business owners of all types in our gift giving and we hope you will want to do the same! Next up we have Aaron and Deirdre of Rusted Pulchritude who we were able to visit in the spring of this year up in Ellsworth, Maine, close to the incredible Acadia National Park and it was so fun to see their process and shop, and get to know them a bit! A shed built by Dierdre and Aaron and the two of them on the right. First off, tell us about your business, and what you do! Our business/creative outlet is called Rusted Pulchritude. 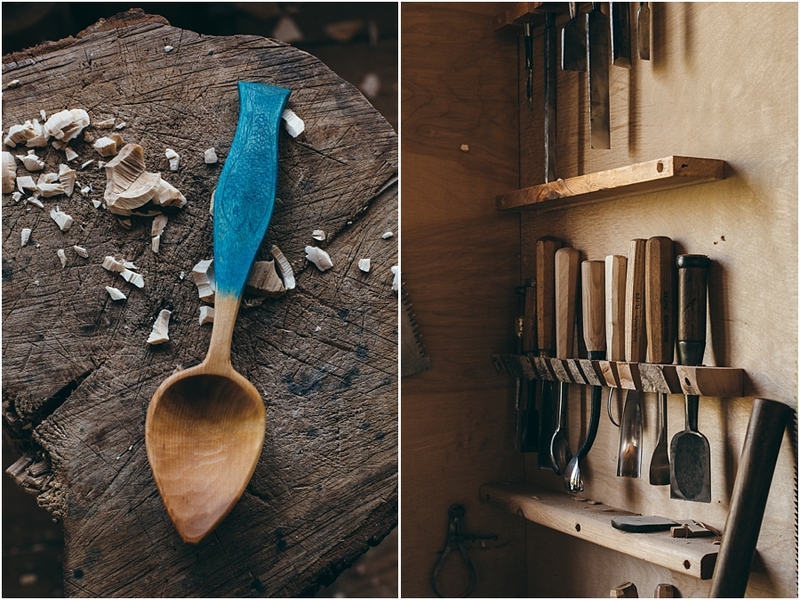 We create wabi sabi wooden wares, including spoons, bowls, and sculptures from local freshly-cut (green) wood using traditional hand carving techniques. We are also co-owners of a co-op craft and art gallery called SevenArts in Ellsworth, ME. What is the story behind your business? How did it all come to be? We’ve both been self-employed with a creative bent previously, including steel bicycle frame building and making housewares using reclaimed materials, but this iteration of being self employed came about rather accidentally. Before we moved to rural Maine we had been working with beautiful, old materials salvaged from under-construction antique houses. Around these parts there’s not much activity in the way of fixing up old buildings, so we lost our source of materials. We had heard about using wood straight out of a log (as opposed to being bought at a lumber yard) to create functional items with, but never really took it seriously until we gained some experience building a timber framed house. We learned a ton about utilizing natural materials straight from our own surrounding woods, and it opened up a world of possibilities for us. We taught ourselves how to carve, started experimenting with our new medium, and a few years later here we are! What is your background, how did you meet your business partner(s), did you always want to be doing this? We met and married many years ago, but never really planned on this specific kind of work per se. What is behind your business name ? Our business name comes from our days of using reclaimed materials: Rusted (we used to do more metal work) + Pulchritude (which means beauty). Most people who recognize the word Pulchritude are then confused by the absence of metal from our work, so it’s come to embody for us a romantic, poetic idea rather than a literal interpretation. Sculptures and one-offs. Repetition can be a big buzzkill for us with our short attention spans. What are your sources of inspiration and creativity? Pretty much everything that surrounds us: art, nature, music, the Japanese concept of wabi sabi, the Swedish craft tradition of slöjd. What do you do when you feel you are in a rut? Travel! A change of scenery always improves things. What has been the most challenging part about having your business? What has been the most rewarding or fun? I’ll start with the most rewarding and fun, which is that we get to work for ourselves on our own terms, and at our own pace, and be creative. The most challenging is finding time to take breaks and enjoy the beauty of our coastal Downeast Maine surroundings, especially during the hectic summer months. Are you originally from New England? How has the New England community played a role in your business? Actually no, we’re both from New York originally. We’ve found that the small town where we live, have our studio and our co-owned gallery has actually made a huge difference in how our business has unfurled. For one, there is a tradition of unusual, quirky woodworkers and creative types in Maine (think Bill Coperthwaite), and we’ve found camaraderie in the community that exists here. Also, we find we’re able to stand out in our smaller town, whereas where we both grew up you have millions upon millions of other people to stand out from, which is a lot easier said than done unless you have connections and clout to begin with. I don’t think we would have gotten this far in this short amount of time if we had stayed in New York. Summers! The influx of visitors that our area has due to Acadia National Park during the summer months is astronomical, almost 3x the normal population of Maine visits Acadia every year! The amount of fresh faces that we come across when doing craft events is truly remarkable, and most everyone is happy because they’re on vacation in nature. The community of our small town is also another favorite thing, people are very friendly and inviting. What other local businesses do you love that we should know about? Other than our brick-and-mortar gallery, SevenArts, in Ellsworth, ME we’d like to mention a few other local and Maine-based businesses, schools, and other craftspeople, all of whom are our woodworking friends: fellow woodcarver Danielle Rose Byrd, Jorge Castañeda aka JC Turnings, Wilcox Haft Co., Liberty Tool and the Hull’s Cove Tool Barn, The Maine Coast Craft School, and Mortise and Tenon Magazine. What does the future look like for your small business? Any grand plans? We’re pretty new at the gallery game, so we’re going to spend the next year really getting situated with that. Otherwise, we’re hoping to get into more sculptural work! The more whimsical the better. Where can we find you or your product in the future? Our wares can be found on our website, where we have a webshop and a list of our stockists nationally. We’re still working out the details of our teaching schedule for next year, but future announcements will be made on our website.